In our world of 24/7 communication, demands and pressure, everyone seems to always be run-down or overwhelmed. (NEW YORK) — In our world of 24/7 communication, demands and pressure, everyone seems to always be run-down or overwhelmed. “It means we’re over-allocated,” Bea Arthur, a New York City-based licensed therapist, said of how she defines burnout. “In your mind, and perception is reality, it feels like you can’t drop any balls,” she said, adding that you can visualize burnout when you think of your life as a pie chart with everything from work to kids and family taking up all the slivers of the pie. 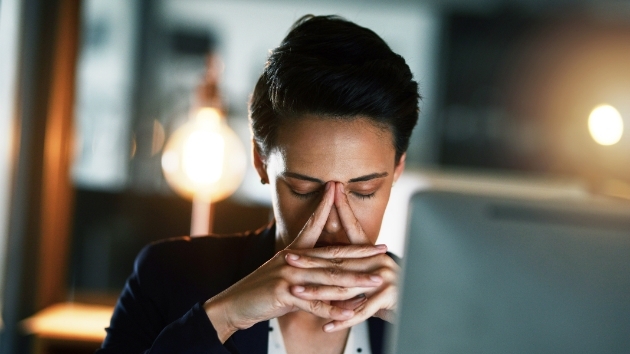 Burnout is just a “matter of degree” difference from the chronic stress that so many people feel, according to Amy Kurtz, author of the bestselling book Kicking Sick: Your Go-To Guide for Thriving With Chronic Health Conditions. “They are seemingly high-effort, low-reward tasks, and they paralyze me,” she wrote. Ann Shoket, author of The Big Life, said the millennial women she meets are often fixated on small things that distract from their bigger lives. Rate yourself on each question below using a number one through four, with one being never, two sometimes, three often and four always. Then total your points from all four questions. “You know what is urgent in your life, like seeing your family and friends more,” said Arthur, who tries not to answer work-related emails and calls past 7 p.m. because she knows, in her work, nothing tragic is going to happen if she answers in the morning. “Even if the work is still there when you get back from vacation, you’ll come back better,” she said. Kurtz, also a health and wellness coach, works with her clients to “flip the script” on burnout by establishing personal rituals.